After years of searching through my junk drawer for pens, paper clips, nails, batteries, take out menus, and all types of miscellaneous items – I finally found a better solution and now have a spare drawer in my kitchen! I call this my junk door. 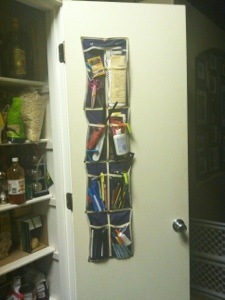 I bought a shoe organizer from the $1 Store and nailed it to the inside of my pantry door, the same door I chalkboard painted a few weeks ago. It is so nice to have everything visible, instead of having to dig through a drawer. Now I don’t know what to do with the empty drawer, which is a nice problem to have!